One reason people think of tenkara as a “short-line” method of fishing may be the interpretation of the term “fixed-line fishing.” Tenkara is a “fixed-line” method of fly-fishing, a term derived from the length of the line being of fixed-length. (i.e. not adjustable while fishing). A fixed length of line does not mean the line must be short. A second reason may be that anyone just starting with tenkara is advised to start out with a short line, often a traditional tenkara line which is easier to cast with, and he or she probably just sticks with it. I have always recommended the use of a line not much longer than the rod to anyone just starting: line plus tippet being about 2 ft longer than the rod. This is strictly to get used to landing fish. This has likely given people the impression tenkara is a short-line method of fishing. But, there is more to it. 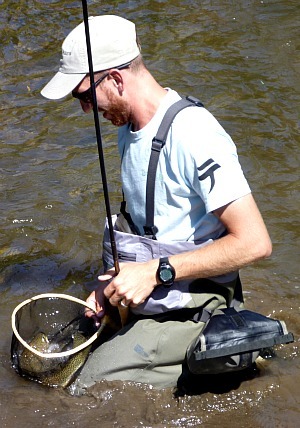 Using a long line with tenkara allows for greater flexibility and for very good fishing. When it comes to casting I believe it is often easier to learn with a slightly longer line, particularly in rivers and bodies of water that are larger and somehow prompt our brains to instinctively want to reach the other side. For purposes of casting, a longer line translates into more weight at the tip of your rod, thus loading the rod more and giving the novice tenkara angler a bit more feel for casting. If I’m able to teach someone in person I prefer to start with a 15 ft long line plus tippet, and often move to 18 ft of line pretty quickly if possible. Before I go any further I’ll spend a little time on my rig. I use level lines almost exclusively. My preferred rod is the Ito (13 ft – 14 ft 7 inches), or the Ayu (13 ft) both of which are long and soft. I prefer a 3.5 level line for its light weight and the fact that I can keep it off the water at great lengths - for most people I’d say the 4.5 level line is very appropriate and a very good choice. Fixed-length doesn’t mean you’re stuck with one line length, and changing lines is very quick if you feel that you must. I carry 2 or 3 line holders with pre-cut lengths of line (plus 4 ft of tippet on each): 15 ft, 20 ft and 25 ft. I find that in most streams where I fish (even some small ones)15 ft is often the shortest length of line that I will use. If I find myself in very tight situations I have been known to cut 3 to 6 ft off the 15 ft line to make it shorter, saving the cut portion and tying them back together later with a blood knot. Note: changing lines should happen very rarely. With experience you’ll learn how to fish with the line you have. It’s very much like using a camera without a zoom: you must learn how to move to frame the image as you want it. When fishing you move upstream, covering water ahead of you. As you move, the spots that are now close to you have already been covered and do not need to be fished again. If you happen to see fish rising close to you, take a few steps back. A fixed-length of line is much less limiting that you think. I have also been known to tie my 15 ft line to my 20 ft line for 35 ft of line and some exciting moments of fishing – though even after mastering the techniques for long-line casting, 30+ ft of line can be a bit tiring and I don’t stick with it for very long. With 25 ft of line on the end of a 14 ft 7 inch rod (and my arm and height) I can often fish about 40 ft away with only fly, tippet and a couple of inches of my line on the water. When fishing with a western fly angler recently, we tried to compare tenkara with western fly fishing in a large mountain stream. After fishing a couple of spots nearby I asked him to fish a good looking pocket about 40 ft away. He told me he couldn’t. “What do you mean, you can’t?”, I asked. He responded, “it’s impossible, I can’t reach that far.” “What do you mean you can’t reach that far, don’t you have some 50 ft of line in that reel of yours?” He got irritated and didn’t try to fish it. I made the cast and caught the fish. Perhaps the best way to talk about fishing long lines may be to relate my experience and progression to using long lines for tenkara. Today I use long lines everywhere I can. When I started practicing tenkara, my line was the same length as my rod. I caught plenty of fish and landed most without a problem. Several months later, I got my first exposure to using lines longer than the rod when fishing with Dr. Ishigaki, the leading authority on tenkara in Japan, in our first encounter. We fished together in the Catskills, NY. Unfortunately the fishing was very poor and all I could learn was casting. I definitely didn’t master my casting at that time, but was just fine with it. We never really got to the fish landing portion of the lesson in that visit. Upon returning to California I made it a priority to learn how to fish with longer lines. The streams I fish here call for it. In my first outing I was probably using about 18 ft of line plus 4 ft of tippet. It was awesome! I could reach on the other side of some streams and that’s when I realized I could now fish spots that were absolutely impossible to fish this way just a few months before – when I was mostly using tenkara but still keeping dust off my reel. I caught some fish in perfect looking spots I had often wanted to reach this way. But, I lost most of them! That was when I realized that landing a fish with a long line was the main challenge with long lines. With a line longer than the rod, at one point one must hand-line the fish in. And, often, particularly with smaller trout, which have less weight to keep the line tight and wiggle erratically, this part takes practice. And, it was just a matter of practice. I kept catching fish, lots of them, and thus getting my practice time for landing fish with a long line. I started landing a larger share of fish, though not yet most of them by any means. I learned to keep the line tight as I brought the fish closer. I learned to let the fish run a bit if he was still very strong. Inasu to Kawasu as it is said in Japanese: fight it when it is weak, let it fight when it is strong. The main tip I always give to anyone is: keep your arm low and close to you. It is much easier to control the rod and line if your arm is not extended up high. Note: the first step to landing a fish with a long line is to be able to reach the line. The main tip I always give to anyone is: keep your arm low and close to you. It is much easier to control the rod and line if your arm is not extended up high. This is very important no matter what length of line you are using. (It is also important for casting.) Here's how you do it: While keeping your arm low, bent at the elbow, tilt the rod tip back. Lower the rod tip behind you to about about a 45 degree angle and when possible reach the line. The most common mistake I see is people raising their rod high to reach the end of the line and the fish. This can work with short lines, but is poor technique and is also handicapping when you move on to long lines. With long lines you will never be able to reach the line simply by raising your rod. You must angle it back while keeping your arm low. Then, I took another trip to Japan and learned the last most important point about landing fish with a long line: keep your cool and bring it to calm water! It is easy to try rushing the steps of landing a fish, and I’m not saying one should take a long time to bring the fish in, but when you’re handling the line do so calmly! And, as you calmly bring the fish closer, situate yourself to bring it to calm water (e.g. a calm pocket behind a boulder). This will ensure the fish is calmer when you land it. Hand-line the fish all the way to the tippet, and don’t be afraid of holding the tippet even with large fish (e.g. 18-20”). If you do the last steps calmly, if you check your tippet periodically and replace it when needed, and your knot is good, you’ll lose very few fish. This part took me quite some time to learn, but has paid off immensely in terms of landing more and larger fish. A net also makes this task much more enjoyable: easier on the fish and easier for yourself. Teaching proper casting technique would take a long article in and of itself, full of diagrams. I’ll relate my quick story but would prefer that you watch the video “Tenkara Masters” where Mr. Sakakibara shows excellent casting techniques. I attribute my main casting lessons to him. 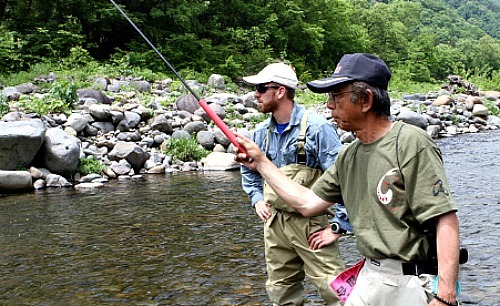 About a year after my first encounter with Dr. Ishigaki, I had the opportunity to visit Japan and participate in a tenkara fly-fishing festival where I met some of the best tenkara anglers in Japan. Among them was Sakakibara Masami (AKA Tenkara no Oni, or “tenkara demon”). Mr. Sakakibara is by far one of the most fluid, elegant casters I have ever met. Even though he is a tenkara master, at the event he asked to cast a western fly rod setup that some guys were trying in the parking lot and his cast was phenomenal - I was a very active member of the Golden Gate Angling and Casting Club in San Francisco, and have seen many excellent casters in that club. He kept his arm very comfortable, close to his body and relaxed. He starts the cast with his forearm, moving it up only a couple of inches first. Then, he uses a bit of wrist, which he says makes the rod flex more and does the work for him. He always wants the fly to land first, so he will stop the rod tip high on the forward cast or very subtly, almost imperceptibly stop the rod tip and move it back just an inch. He makes his cast look very effortless and relaxed! So, upon returning from that trip, I would hit my favorite large mountain streams and focused on using a long level line, about 20 ft of line plus 4 ft of tippet usually. My only goals were to make my casts look as effortless as his and get my fly to land first with no line landing on the water. That was it! I practiced that, probably keeping the points above in mind, and eventually the casts started working consistently and the muscle-memory became completely ingrained. Use less power! For men already accustomed to western fly-fishing: cut your original power in half…and halve it again. Stop the back-cast at 12 o’clock. The back-cast is the most important part of the cast: you want speed, but little power – this is a hard distinction to make, and you want the line to stretch back before being slung forward. 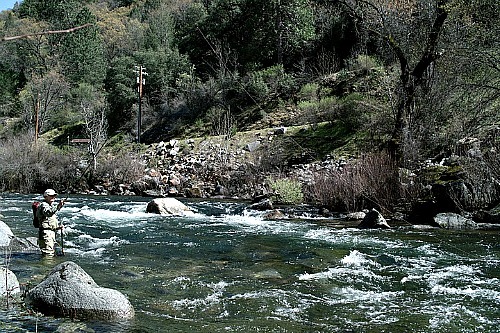 Daniel Galhardo is founder of Tenkara USA, the first company to introduce tenkara outside of Japan. He has spent years learning tenkara and in frequent visits to Japan, Daniel has developed strong relationships with the best tenkara masters in the country. He relies on their teaching to introduce the traditional tenkara practice to anglers outside of Japan, and has created a bit of a revolution in the world of fly-fishing by insisting that fly-fishing can be simple.